Here you are reading a dentist’s blog, so we think it’s safe to assume you care about your teeth. That’s great news, because we care about them, too. Did you know that 25% of Americans actively shy away from smiling because of the condition of their teeth/mouth? That statistic doesn’t make us smile at all. Many people are content with rarely (sometimes never) going to the dentist, which we don’t recommend. Now, we do trust that you know how to take care of your teeth and mouth, but sometimes oral care routines become so, well, routine that it’s easy to let vigilance slip. One strangely common practice that we’ve seen more of in recent years is people brushing too hard. Some might assume this problem to be more common in children who haven’t quite grasped the gentle dexterity needed to effectively handle a toothbrush, but adults are equally guilty and it stems back to a simple thought pattern: the more vigorous the brush, the cleaner the teeth. We can assure you this isn’t the case and we’ve compiled some reasons you’ll likely hear in your next dental exam. One of the more common complaints in dentistry is sensitive teeth. While sensitivity to cold or hot beverages is relatively commonplace, a reason we’re seeing this happen is people brushing so hard they’re stripping the enamel from their own teeth. Enamel is your teeth’s body armor, it protects them. 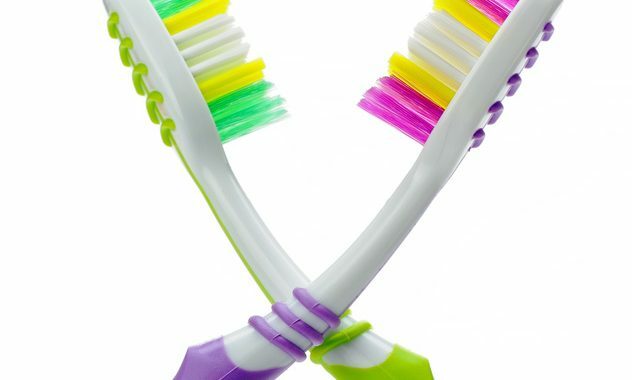 Neither plaque nor tartar buildup is more resilient than enamel, so if this is happening, it’s time to reduce your brushing intensity by several notches. Gum recession is another part of oral health that contributes to tooth sensitivity caused by brushing overly hard. If you’re brushing hard enough to strip enamel from your teeth, think about how the delicate skin in your gums is taking that. Some light bleeding happens when brushing your teeth, but doing it too hard will see excessive bleeding and eventual recession of the gum line. Your gums protect your teeth, so when they recede, more of your teeth are exposed, hence the sensitivity. This can lead to periodontal complications (gum disease) we’re certain you want no part of. There are simple ways to keep yourself from doing this: soft bristle brush, fluoride toothpaste and mouthwash, and focusing on using less elbow grease while brushing. Hold your toothbrush like a paintbrush, not like a hammer. Massage around gumline as well as on the teeth. Don’t treat your mouth like you’re riding into medieval battle, give it the pampering your sparkling smile deserves and relax. Oh, you might’ve thought we’d forget, but you still have to floss.